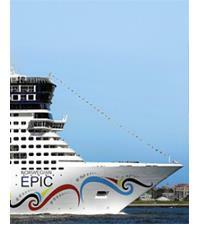 Today, the new large cruise ships have brought in a new era of cruising. Revolutionizing the onboard experience, these super megaships are more like small cities that offer something for everyone. Families travelling in large group of diverse travelers; young couples, kids and grandparents, who enjoy resort-style activities and nighttime just as much as discovering new places, should consider travelling on large cruise ships. 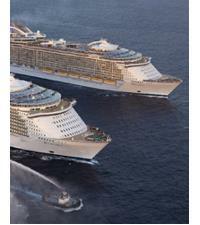 Royal Caribbean International’s Oasis of the Seas is currently the world's second largest cruise ship (1,187-foot-long). 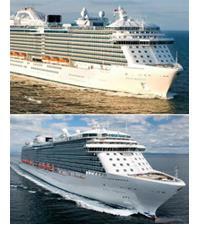 Its sister ship Allure of the Seas, which is two inches longer, is the world’s largest one. Launched in 2009, Oasis of the Seas has 16 decks, 2700 staterooms with guest capacity of 6296, seven unique neighbourhoods, each designed individually to house numerous incomparable experiences and activities and 25 dining options. The Oasis of the Seas sails Western Caribbean with an exciting 7 night round-trip itinerary from Fort Lauderdale, Florida all year round. The Allure of the Seas launched in 2010 is almost similar to its sister ship but it does have certain unique breathtaking attractions. 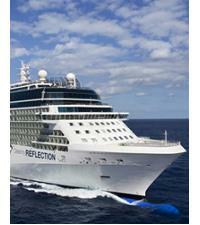 It sails Eastern Caribbean with an exciting 7 night round-trip itinerary from Fort Lauderdale, Florida all year round. Weighing 141,000 tons, Royal Princess, with 1,780 staterooms and guest capacity of 3,600, is the largest ship of the Princess Cruises fleet. 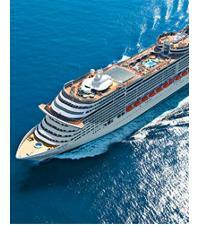 Launched in April 2013, the ship offers numerous next-generation luxurious features and amenities to its passengers. The Royal Princess sails through Scandinavia & Russia with an exciting 11 days round-trip itinerary from Warnemunde, Germany from May till August. The cruise takes passengers through eight ports of call namely Warnemunde; Tallin; St. Petersberg; Helsinki; Stockholm; Copenhagen; Oslo; and Aarhus. The Royal Princess’s sister ship Regal Princess launched in May 2014 has almost similar key features but it does offer certain new innovative experiences like a flexible anytime dinning option, first on any of Princess Cruise Ships; the aft pool and the Promenade deck. The Regal Princess sails through Grand Mediterranean with an exciting 12 days itinerary from Barcelona, Spain from July till October. The Norwegian Epic sails through Western Mediterranean with an exciting 7 day round-trip itinerary from Barcelona, Spain from May till November. 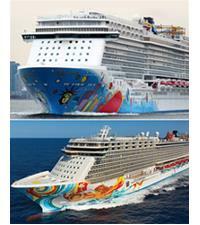 The Norwegian Breakaway sails through Bahamas and Florida with an exciting 7- nights round-trip itinerary from New York, USA from February till April and October till December and The Norwegian Getaway, sails Eastern Caribbean with an exciting 7 days round-trip itinerary from New Miami, Florida, USA all year round. Weighing 140,000 tons with 1751 staterooms, 14 decks and guest capacity of 4,345, MSC Preziosa is the fourth and the largest ship in MSC's Fantasia class. The elegant megaship has enormous Mediterranean touch to its décor, evident from its Swarovski-studded stairs, decks named after precious gem stones & jewels, abundant shimmering glass mosaics, Murano glass, white marble and lavish public rooms adorned with animal prints. The MSC Preziosa sails through Mediterranean with an exciting 7- nights round-trip itinerary from Bari, Italy in May and June. Launched in October 2012, Celebrity Reflection is the latest and the largest addition to the Celebrity’s Solstice class of ships. Weighing 122,000 tons with guest capacity of 3,046, the ship features13 decks and 34 first everAquaClass Suites that have spectacular 79 sq ft verandas. The Celebrity Reflection sails Eastern Mediterranean with an exciting 11 nights round-trip itinerary from Rome (Civitavecchia), Italy from April till October. Weighing 1,30,000 tons with 1,250 staterooms, 14 decks and guest capacity of 4,000, Disney Fantasy is the largest and the newest addition to the Disney Cruise Line fleet. Launched in March 2012, the Fantasy is a luxurious family-friendly vessel boasting state-of-the-art amenities. 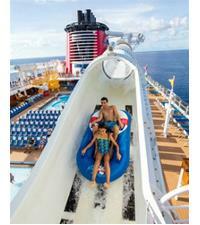 Passengers of all ages sail on this mega-ship, lured by its Disney magic. The Disney Fantasy sails through Western Caribbean with an exciting 7- nights round-trip itinerary from Port Canaveral, Florida, USA from May till November.